Italy is one of the most beautiful and culturally rich countries in the world to visit, and every year hundreds of thousands of people flock there to see the Pope, the Sistine Chapel, The Coloseum, The Pantheon, and of course, the beautiful Amalfi Coast. But there is so much more to see. Visit a coastal fishing village that will delight you with history and adventure, and relax on breathtakingly beautiful beaches. Make time for a true paradise on Earth if you want to explore a famous tourist destination through an authentic lens. 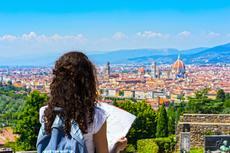 Italy is one of the Top 16 countries where Americans move to live. Italians live longer; the standard of living has increased for everybody; and most people are able to afford better food and do things that make them happy. Adventurous travelers are already making plans to visit new and underexplored destinations in 2017. A strong dollar has enabled more people to leave the country and undertake a quest they would not have considered before. Make unexplored parts of The Boot part of your next crazy, bucket list adventure.